The Mannen-Cho area of Devil Summoner 2 is apparently an area populated mostly by gamblers and crossdressers. 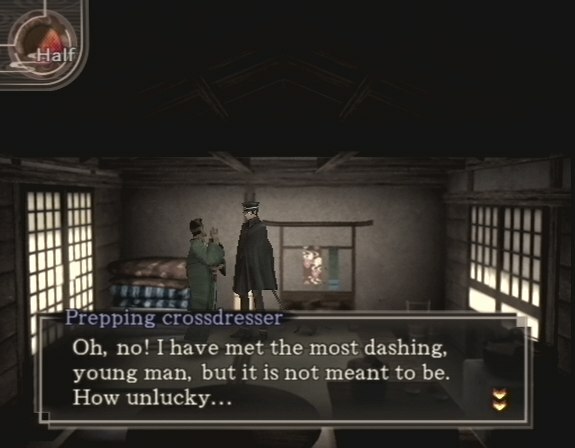 After first arriving in this area, the player meets a character labelled simply “prepping crossdresser” (image below) who laments: “I exposed my unshaven face to him! Alas! How cruel fate can be to one such as I…” (according to this walkthough). 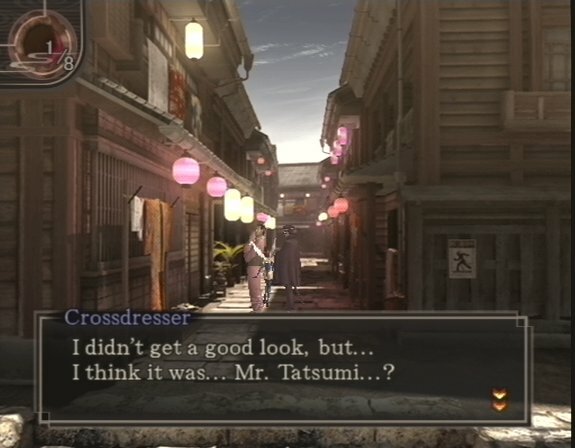 When the player is chasing down Tatsumi, they run into an NPC who is labelled “Crossdresser” (image below). 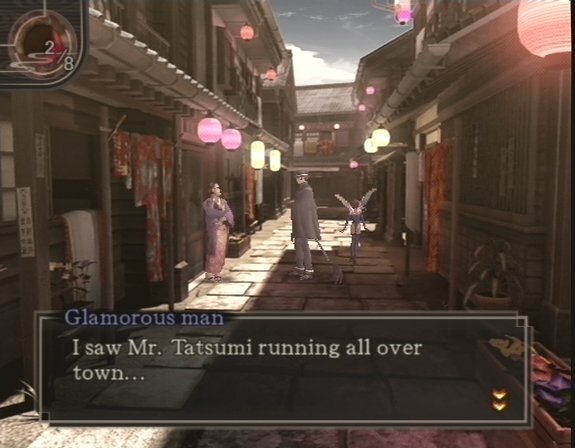 Down the street, the player-character runs into another character ambiguously called “glamorous man,” who is dressed in a similar manner to the crossdressing character (image below). The former refers to herself as a lady, though it is unclear if that is an indication of the NPC’s gender identity, given the “crossdresser” label. There is also nothing in the “glamorous man’s” dialogue to indicate his sexuality or gender identity. If the player uses a skill order demon to examine the “crossdresser,” they will obtain the character’s hair and be able to transform into the NPC (i.e., transform into a crossdresser themselves). The hair is reportedly labelled “Kamanari’s Hair,” but the player only finds out this character’s name through this process. At other point in the game Kamanari gives the player character a case file.